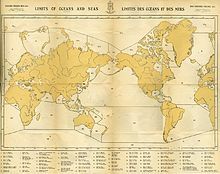 Borders and names for oceans and seas were internationally agreed when the International Hydrographic Bureau (IHB), the precusor to the IHO, convened the First International Conference on 24 July 1919. 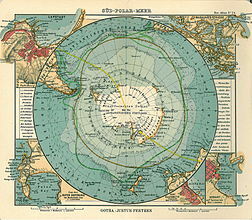 The IHO then published these in its Limits of Oceans and Seas, the first edition being 1928. Since the first edition, the limits of the Southern Ocean have moved progressively southwards; since 1953, it has been omitted from the official publication and left to local hydrographic offices to determine their own limits. 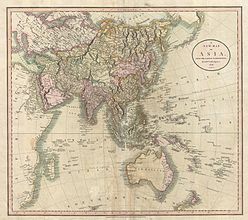 The IHO included the ocean and its definition as the waters south of 60°S in its year 2000 revisions, but this has not been formally adopted, due to continuing impasses over other areas of the text, such as the naming dispute over the Sea of Japan. The 2000 IHO definition, however, was circulated in a draft edition in 2002 and is used by some within the IHO and by some other organizations such as the US Central Intelligence Agency and Merriam-Webster. 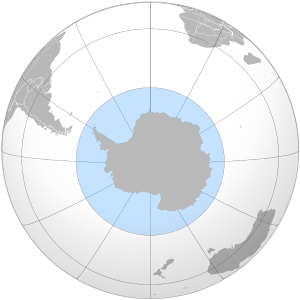 [note 5] Australian authorities regard the Southern Ocean as lying immediately south of Australia. 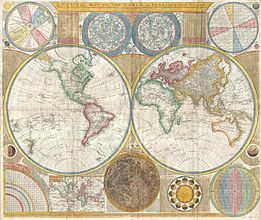 The National Geographic Society does not recognize the ocean, depicting it (if at all) in a typeface different from the other world oceans; instead, it shows the Pacific, Atlantic, and Indian Oceans extending to Antarctica on both its print and on line maps. 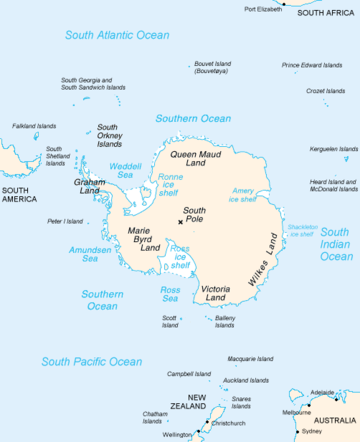 [note 6] Map publishers using the term Southern Ocean on their maps include Hema Maps and GeoNova. 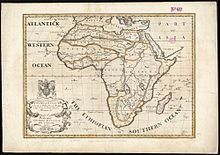 The visit to South Georgia by Anthony de la Roché in 1675 was the first ever discovery of land south of the Antarctic Convergence i.e. in the Southern Ocean / Antarctic. Soon after the voyage cartographers started to depict �?Roché Island’, honouring the discoverer. 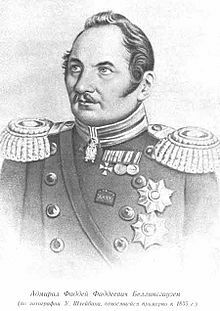 James Cook was aware of la Roché's discovery when surveying and mapping the island in 1775. 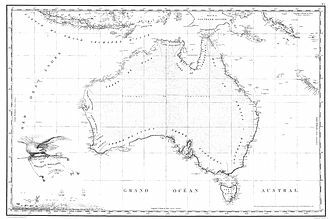 Freycinet Map of 1811 – resulted from the 1800-1803 French Baudin expedition to Australia and was the first full map of Australia ever to be published. 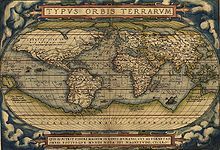 In French, the map named the ocean immediately below Australia as the Grand Océan Austral (�?Great Southern Ocean’). 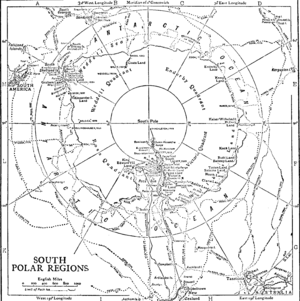 1906 map by German publisher Justus Perthes showing Antarctica encompassed by an Antarktischer (Sudl. 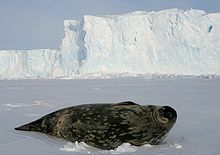 Eismeer) Ocean – the �?Antarctic (South Arctic) Ocean’. 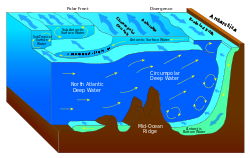 Sea temperatures vary from about �?�2 to 10 °C (28 to 50 °F). 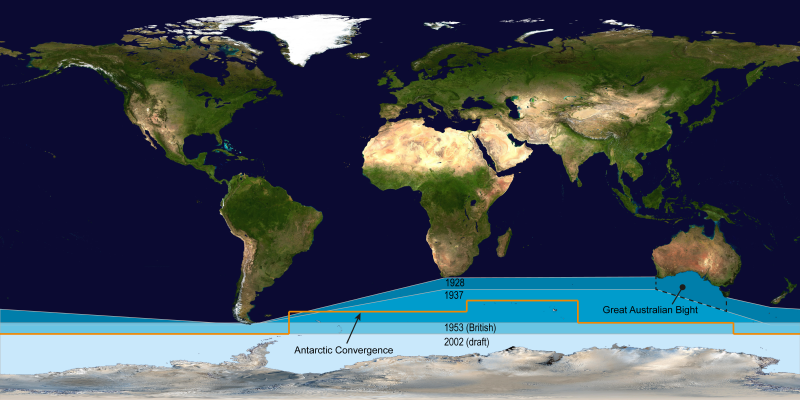 Cyclonic storms travel eastward around the continent and frequently become intense because of the temperature contrast between ice and open ocean. 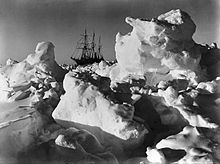 The ocean-area from about latitude 40 south to the Antarctic Circle has the strongest average winds found anywhere on Earth. 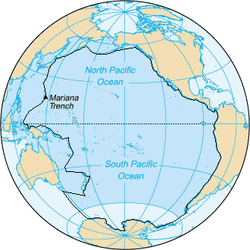 In winter the ocean freezes outward to 65 degrees south latitude in the Pacific sector and 55 degrees south latitude in the Atlantic sector, lowering surface temperatures well below 0 degrees Celsius. At some coastal points, however, persistent intense drainage winds from the interior keep the shoreline ice-free throughout the winter. 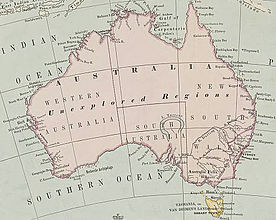 ^ a b c d e "Geography - Southern Ocean". CIA Factbook. Retrieved 16 July 2012. 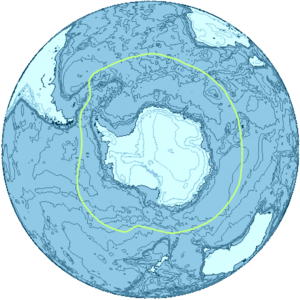 ... the Southern Ocean has the unique distinction of being a large circumpolar body of water totally encircling the continent of Antarctica; this ring of water lies between 60 degrees south latitude and the coast of Antarctica and encompasses 360 degrees of longitude. ^ a b c "Introduction - Southern Ocean". CIA Factbook. Retrieved 16 July 2012. 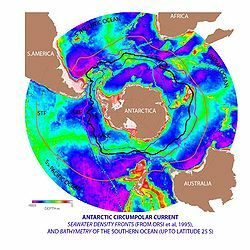 ...As such, the Southern Ocean is now the fourth largest of the world's five oceans (after the Pacific Ocean, Atlantic Ocean, and Indian Ocean, but larger than the Arctic Ocean). ^ a b "Indian Ocean". Encyclopaedia Britannica. Retrieved 13 January 2013. ^ a b c "Southern Ocean - News Watch". National Geographic. Retrieved 26 April 2013. ^ Tomlins, Sir Thomas Edlyne; Raithby, John (1811). "18 George II c.17". The statutes at large, of England and of Great-Britain: from Magna Carta to the union of the kingdoms of Great Britain and Ireland. Printed by G. Eyre and A. Strahan. p. 153. Retrieved 1 November 2015. ^ Payne, John (1796). 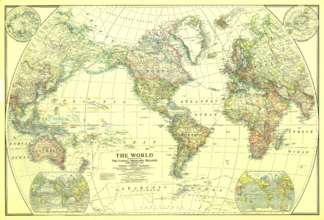 Geographical extracts, forming a general view of earth and nature... illustrated with maps. London: G. G. and J. Robinson. p. 80. Retrieved 1 November 2015. ^ "45 Vict. No.702" (PDF). Australasian Legal Information Institute. 28 November 1881. p. 87. Retrieved 2 November 2015. ^ "IHO Special Publication 23". Korean Hydrographic and Oceanographic Administration. Retrieved 19 January 2014. ^ "Southern Ocean". Encyclopaedia Britannica. Retrieved 24 January 2013. ^ "- Assessment Documentation for Cape Leeuwin Lighthouse" (PDF). Register of Heritage Places. 13 May 2005. p. 11. Retrieved 13 October 2010. ^ a b One or more of the preceding sentences incorporates text from a publication now in the public domain: Chisholm, Hugh, ed. (1911). "Polar Regions". Encyclopædia Britannica (11th ed.). Cambridge University Press. ^ Dance, Nathaniel (c. 1776). 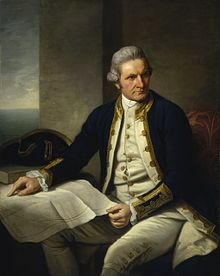 "Captain James Cook, 1728-79". Royal Museums Greenwich. Commissioned by Sir Joseph Banks. Retrieved 23 January 2014. ^ U.S. Antarctic Program External Panel. "Antarctica —past and present" (PDF). NSF. Retrieved 14 November 2007. ^ Guy G. Guthridge. "Nathaniel Brown Palmer". NASA. Retrieved 14 November 2007. ^ Navy Military History. History.navy.mil. Retrieved on 29 January 2012. ^ "MS Explorer — situation report". The Falkland Islands News. 23 November 2007. 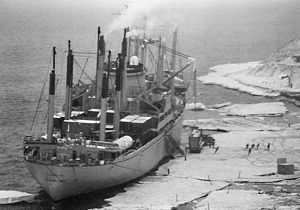 ^ a b c Australian Antarctic Division. "Fish". Government of Australia. Archived from the original on 19 March 2013. Retrieved 5 April 2013. ^ Australian Antarctic Division. 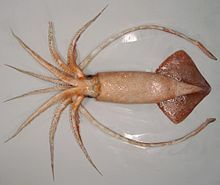 "Squid". Government of Australia. Archived from the original on 19 March 2013. Retrieved 8 April 2013. ^ Smith RC, Prézelin BB, Baker KS, Bidigare RR, Boucher NP, Coley T, Karentz D, MacIntyre S, Matlick HA, Menzies D, et al. (1992). 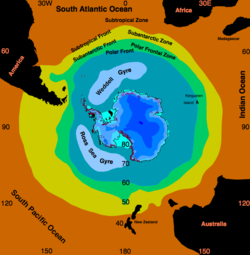 "Ozone depletion: ultraviolet radiation and phytoplankton biology in antarctic waters.". Science. 255 (5047): 952–9. doi:10.1126/science.1546292. ISSN 0036-8075. PMID 1546292. ^ "The World Fact Book: Environment - International Agreements". U.S. Central Intelligence Agency. Retrieved 19 January 2014. 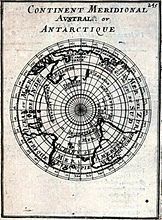 "Antarctic Ocean", Encyclopædia Britannica, 9th ed., Vol. II, New York: Charles Scribner's Sons, 1878, p. 100 . "Great Southern Ocean", Encyclopædia Britannica, 11th ed., Vol. XII, New York: Encyclopædia Britannica, 1911, p. 422 . "Antarctic Ocean, Austral Ocean, Southern Ocean", Style Manual, Washington: National Geographic Society, 2014, retrieved 31 July 2015 . This page was last modified on 12 January 2017, at 16:41.